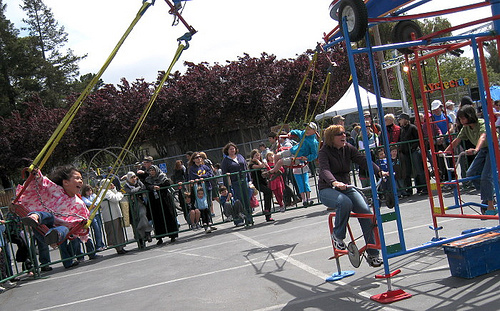 The Maker Faire in San Mateo doesn’t draw 90,000 people over a single weekend because it is dry, dreary or serious. JOY is the subtext of Maker Faire. 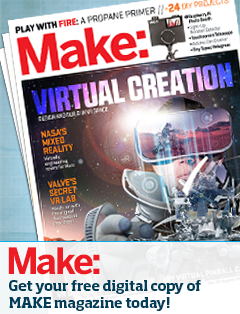 People come in droves to the Maker Faire because it is fun! 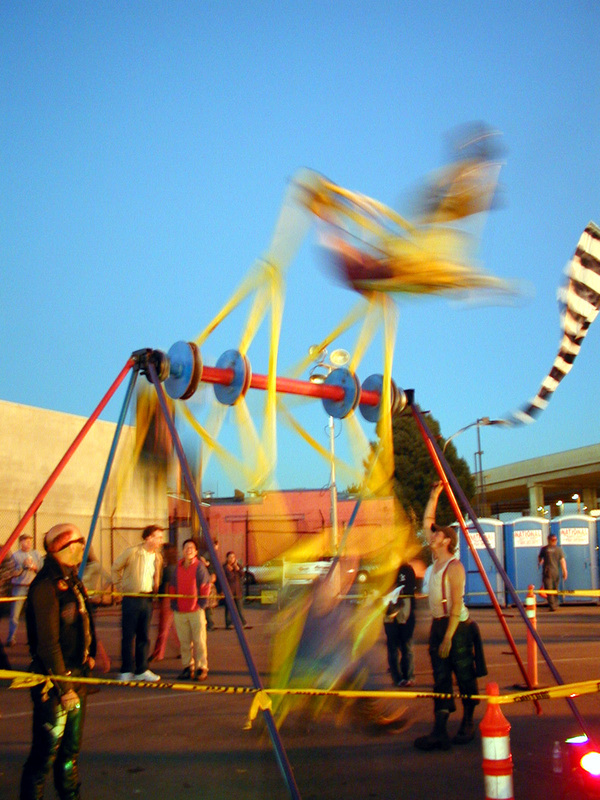 You might dispute this, but I would wager that the most fun and joyful exhibit at Maker Faire is the two-punch combo of Paul’s Rides and Cyclecide. That’s why I’m particularly thrilled to announce that Paul’s Rides and Cyclecide will be making their magic happen at the inaugural 2010 East Bay Mini Maker Faire! 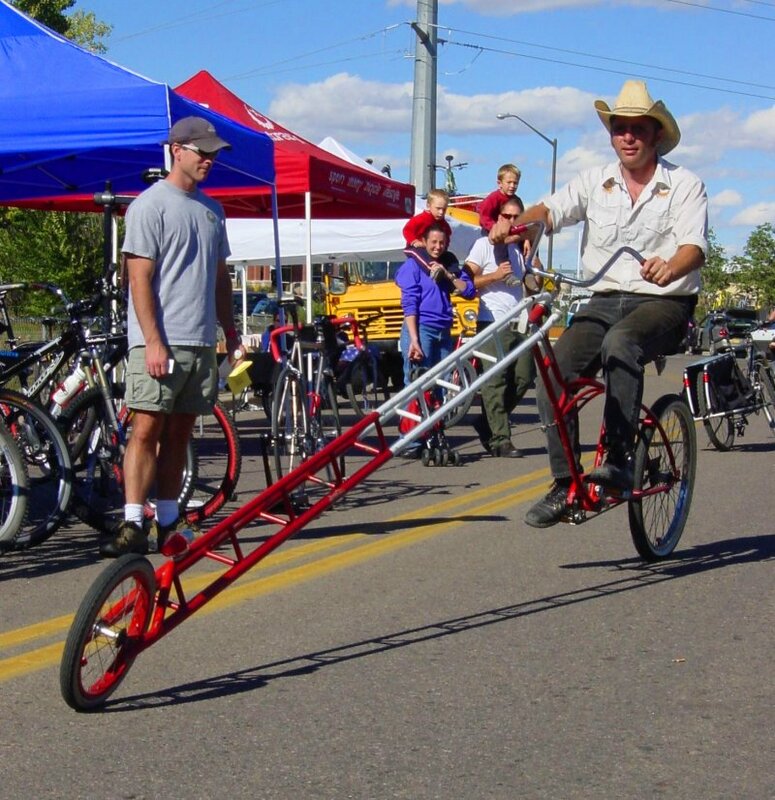 Paul’s Rides are pedal-powered carnival rides. Two- and three-person ferris wheels; tiny and big carousels, two- and six-seater dizzy toys. These are rides that make you scream out loud and make you dizzy with good old centrifugal force. You get off and can’t walk straight. Paul’s Rides are human-powered hilarity. 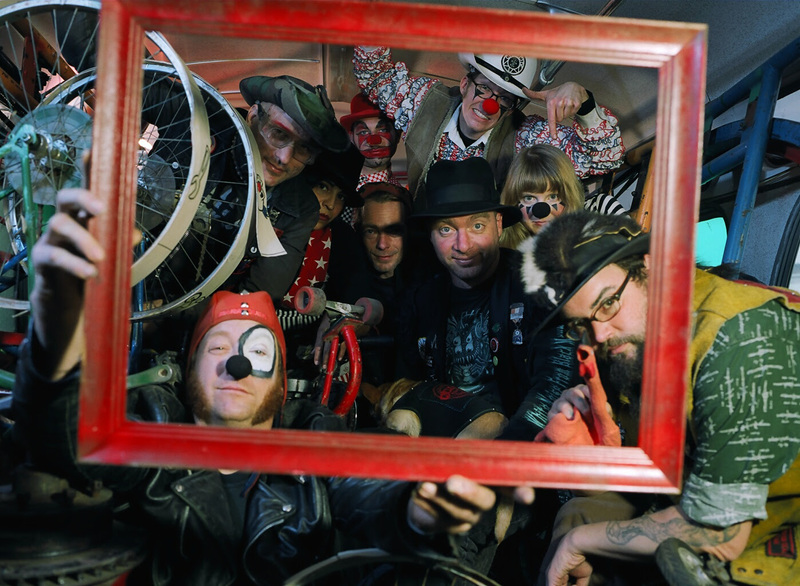 Cyclecide, though, is the band of kooks and tinkerers and performers who helped build the rides with Paul and who have incorporated the rides into a kinetic circus involving jousting, clowns, mash-up cycles, rodeo rituals, inner tubes, and tu-tus. The Heavy Pedal Cyclecide Bike Rodeo makes it all come together. 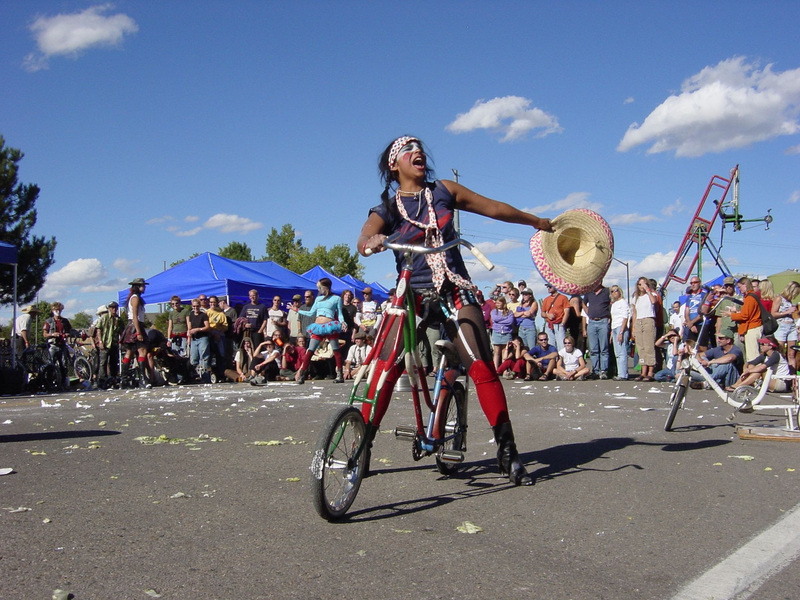 Inspired by discarded bikes, American rodeo culture, and punk rock, Cyclecide assembled itself way back in 1995. 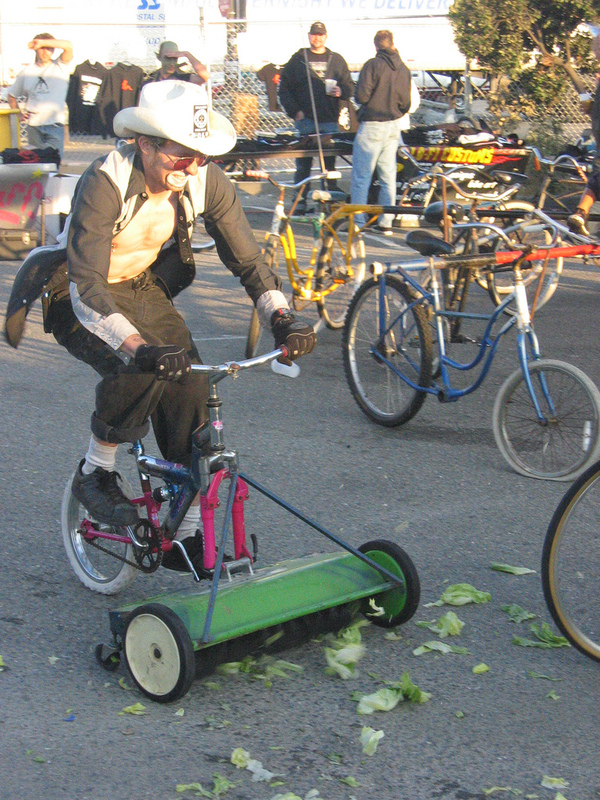 First it was building funny bikes (the Lawn Mower bike, crazy choppers, tall bikes, and the fire-breathing Chupacabra). Along the way it morphed into a full-blown bike rodeo, complete with a house band (“Los Banos”) and stage show, and the fabulous ride midway. 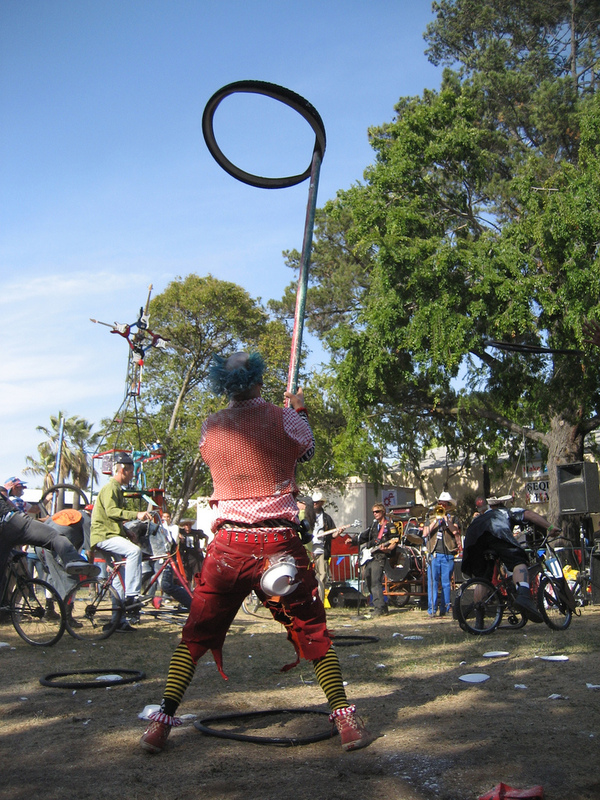 The show always includes musical interludes and comedic skits and stunts involving the whacked-out bikes and the Cyclecide staff rodeo clowns, stunt riders, and beauty queens. Chances to experience this quality of interactive fun just come every so often in life. 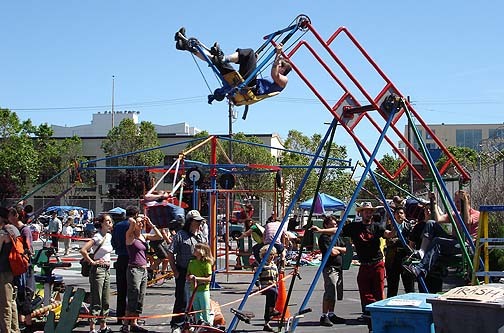 Circle your calendar now for October 24 and get your g-force giggles out with the Heavy Pedal Cyclecide Bike Rodeo at the 2010 East Bay Mini Maker Faire!